Everton’s striking new third kit will be given its debut this Saturday when Roberto Martinez’s men take on SC Paderborn in Germany. The Blues will don the white, blackberry and yellow playing strip for the final pre-season friendly ahead of the 2014/15 Premier League campaign. The third strip, which has been officially unveiled today, completes a hat-trick of stylish new kits for the new season. The royal blue home jersey was revealed to much acclaim earlier this summer and has been snapped up by Evertonians keen to proudly wear their colours. Meanwhile, the all-black away playing kit is now available to pre-order and will go on sale on Thursday 14 August. The third kit is predominantly white and blackberry with yellow detailing and features all the performance attributes required for the modern game. 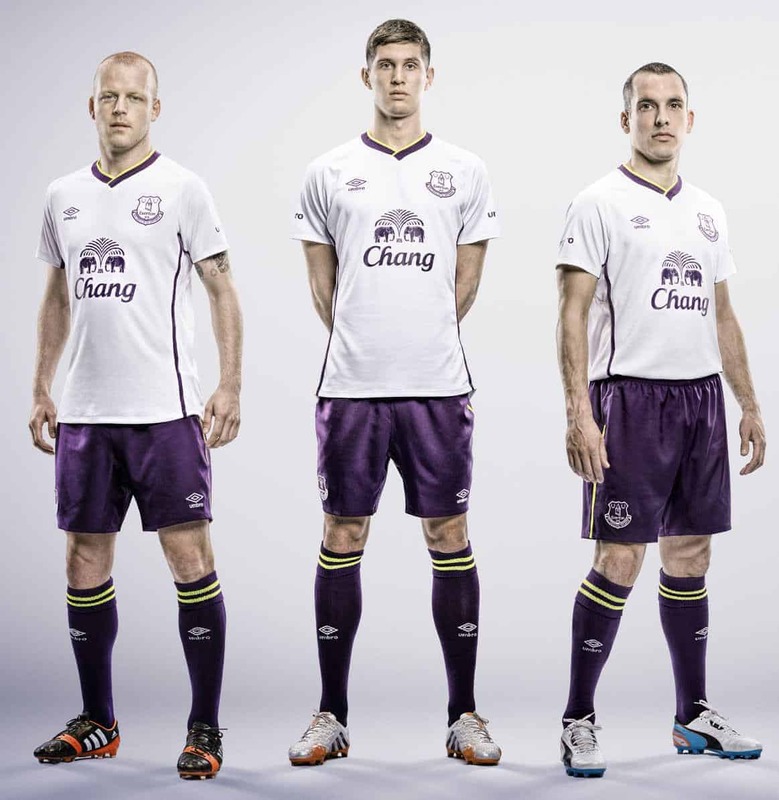 Steven Naismith said: “It’s a really smart, stylish kit and will really stand out on the pitch. I like that it’s so different to the home and away strips. The white jersey features a v-neck wrap-over collar with a high-stretch rib for comfort whilst a mesh stripe gives the shirt a stylish finish. On the back of the shirt, there are eight laser-cut ventilation holes, with the top one on each side in the shape of the Toffee Tower, giving a unique sign-off for the Club. The blackberry shorts and socks, with yellow trip, complete the look. Everton’s new 2014/15 third kit is available to pre-order from 18 August and goes on sale 18 September. It will be available for men, women, juniors, infants and babies.